Has this ever happened to you? You put your glasses down someplace, and then you can’t find them because you aren’t wearing your glasses! I wear glasses for distance, so I take them off when I get home. I also need them when I am watching television. I try to put them down in the same place every time, but the reality is I am not always consistent. So I vowed to find a product so fun to use that I would be guaranteed to put my glasses there every time. And I found one! It’s call the Eye Bod, and it is an adorable little glass creature with a bulbous nose and a slot in the middle of his head just perfect for your earpieces. 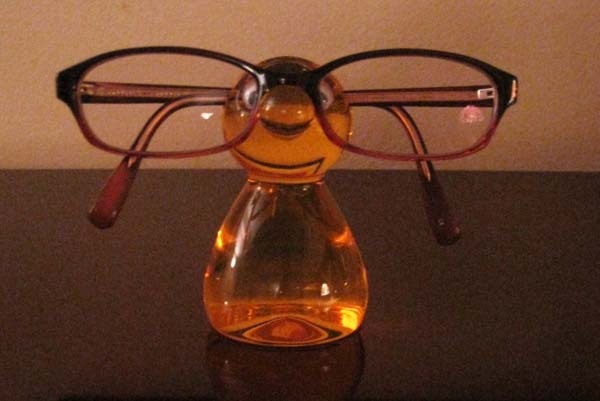 I get such a kick out of putting my glasses on this little fella, so he keeps me fairly consistent. I bought the Eye Bod at a fun store in my Upper East Side neighborhood called Maxiga. If you’re nowhere near the UES, you can buy it online at Joie de Vivre, Moxie, or Gazebo Gift Co. Or simply search for “Eye Bods Eyeglass Holder” on the web.